Who are singing lessons for? I believe that music is for everyone. You don’t need previous experience, just the desire to sing. 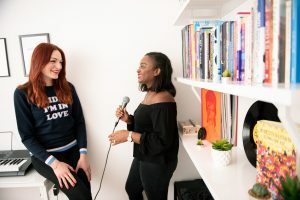 I teach both adults and children- from complete beginners who want to find their voice and increase their confidence to professional singers who are preparing for auditions, tours and recording sessions! Singing Lessons for kids encourage children to use their innate musicality, and nurture their love of singing. I have a full CRB (DBS) certificate, public liability insurance and I’m a licensed First Aider. I’ve also completed Child Protection Awareness training with the Musicians Union. 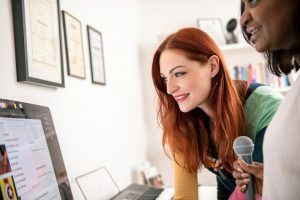 Private singing tuition is tailored to your needs, and is adapted to your pace and learning style. Lessons are fun, relaxed and empowering. You will apply vocal technique to your favourite songs, learning in a way that is enjoyable! Which styles of singing do you teach? I teach all contemporary vocal styles, including pop, rock, blues, folk, country, jazz, R’n’B and Soul. 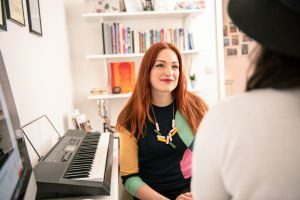 Lessons take place in my vocal studio in Kentish Town which is fully equipped with a range of Microphones, a PA system, synthesiser, Logic Pro recording software and an extensive song library. The studio is conveniently located less than a 3 minute walk from Kentish Town West Overground station and a 10 minute walk from Kentish Town Underground and national rail stations. Local buses also run frequently to most parts of North and Central London. There is free parking available on the street after 6:30pm Monday to Friday and all day on Weekends. 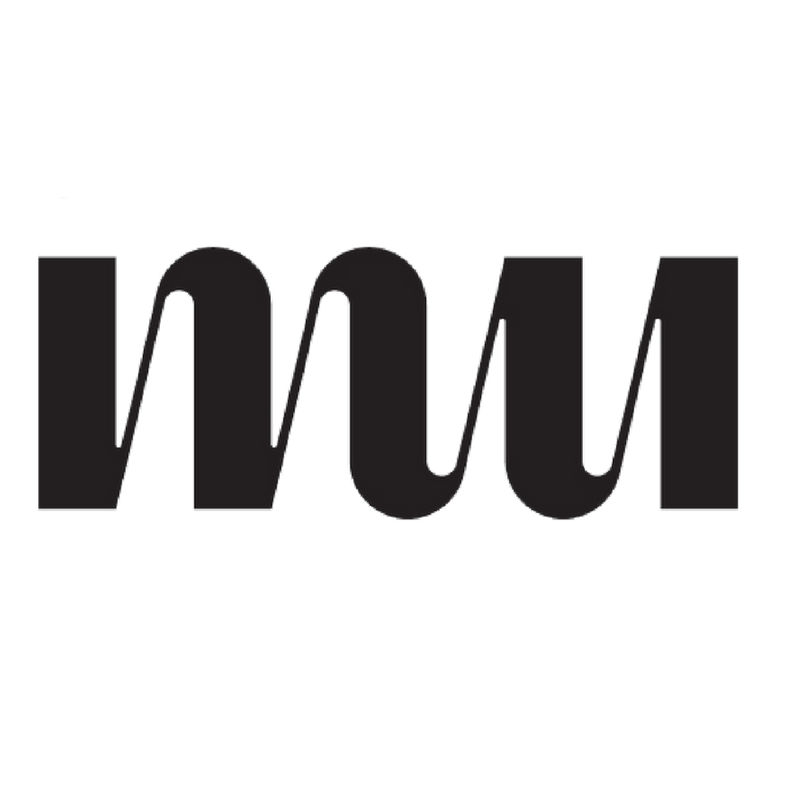 Online singing lessons are also available (via FaceTime or Skype!) You will need a good camera and microphone on your device, as well as a strong internet connection. Singing Lessons are £25 for 30 minutes and £45 for an hour long lesson. For adults, especially beginners, hourly lessons are recommended. A 10% discount is available when booking a pre-paid package of 6 lessons (£243 instead of £270). What are your payment/ refund policies? Payment for each lesson is required at the time of booking- due to high demand for lessons, the industry standard 24 hour cancellation policy applies, so you will get a full refund if you decide to cancel for any reason up until 24 hours before the lesson start time. If less notice is given, lessons are missed, or you are late to your scheduled lesson, the full cost of the lesson will be charged. ‘Homework’ can be set to continue your practice at home. This is completely optional, there is no pressure to practice in between lessons – but you will progress more quickly if you do! Yes- a 10% discount is available when booking a pre-paid package of 6 lessons (£243 instead of £270). This is ideal for those who wish to commit to their progress whilst saving money too. Understand how your voice works. Learn good posture for singing. Gain control of pitch and tone. Enjoy exploring your voice in a positive, non-judgemental environment! Effectively learn and remember lyrics. Grow in confidence as a performer. Master the skill of ‘acting through song’. Make songs your own- from song interpretation to lyrical phrasing. Find your identity as an artist. Develop your stage presence and connect with your audience. Guidance/ tips and feedback for songwriting.